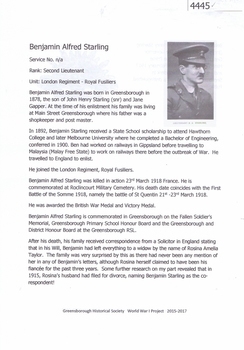 A short history of Edward Bernard Green, after whom Greensborough was named. 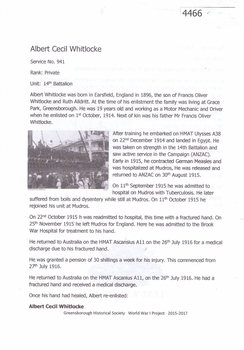 Describes his various business activities including his purchase of property on the Plenty River and his contract for the carriage of mail overland between Melbourne and Sydney. Author unknown. Background on the origins of "Greensborough". 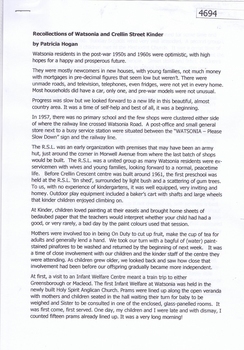 Recollections of Watsonia in the 1950s and 1960s, written by Patricia Hogan. Batch of 2 photos and 9 documents relating to Martin Balsarini. Used in WWI project. 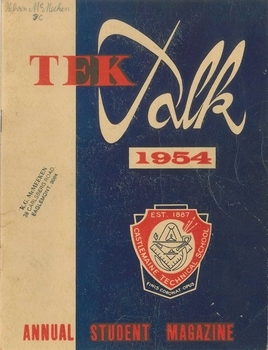 1965 School Magazine with 53 un-numbered pages. 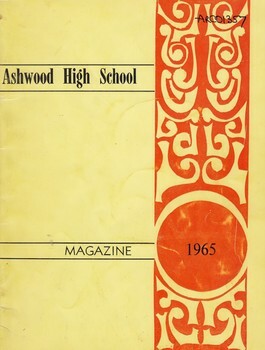 1965 Magazine of Ashwood High School with historical events of the year. A4 x 3 paper folded to A5 x 6pp with colour photographs. This is Vol. 6 of the Moorabbin Mirror produced by CMHS members Fran & Holger Bader , Valma Sharp April 2016 The Moorabbin Mirror reflects the history and heritage of the former City of Moorabbin — derived from Mooroobin, ‘a resting place’ in the Bunurrung spoken language. In 1994, the City of Moorabbin was integrated into the Cities of Bayside, Glen Eira, Kingston and Monash. This issue of the Moorabbin Mirror is dedicated to all the young, and not so young, men and women from the former City of Moorabbin who served ‘King and Country’ during the Great War. Especially those who never came home including a photo of WW1 Mordialloc Memorial and the 2016 Local Commemorative Services. Valma Sharp CMHS President 'officially opened' the new WC and thanked GECC for this amenity. Members and Guests then shared light refreshments before welcoming visitors to the BCM Extra Open Day. Unfortunately Lorna Thatcher was unable to attend due to a sudden illness and Committee and members sent Get Well wishes via Frank. The Diary informs members of the Extra Open Days, upcoming publicity events , Meetings and Community Group visits to BCM, Local interest items include Lees Nursery, Market Gardening Heritage, Westall UFO, Joyce Park Playground Solar System., Moorabbin Ten Pin Bowl and the School Amateur Radio Special Event. The Committee is very grateful for the help provided by David Hardham GEHS to set up our new CMHS website. An informative article re the 2012 GESAC that replaced the 1964 Olympic Pool. Information is requested for the Roving Curator August Rietman display 2017. 3 pages, text and colour images. 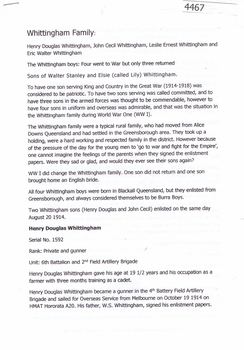 A short article about the Whittingham family and their service in World War 1. Written by Rosie Bray, this article covers the four Whittingham brothers who lived in Greensborough. 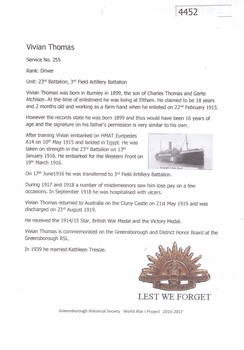 A short article about Vivian Thomas and his service in World War 1. Vivian Thomas is remembered on the Greensborough State School Honor Board. 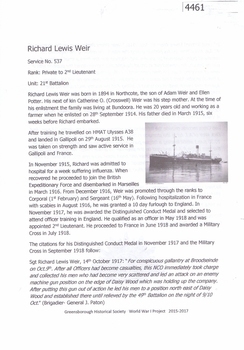 A short article about Richard Lewis Weir and his service in World War 1. 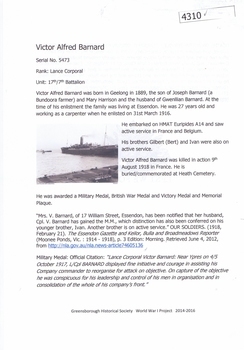 Richard Weir lived in Bundoora and is commemorated on the Fallen Soldiers' Memorial in Greensborough..
A short article about Victor Alfred Barnard and his service in World War 1. 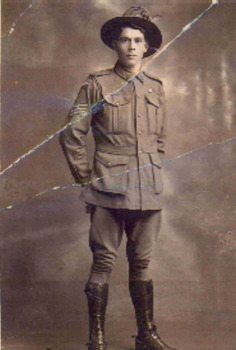 At the time of Victor Alfred Barnard's enlistment, he was living in Bundoora. 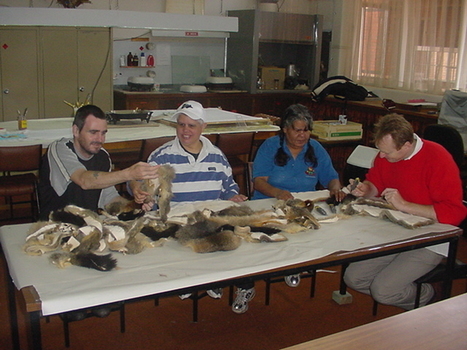 Photograph of students makig the Ballarat School of Mines Possum Skin Cloak. Hall of Fame Citation for John Carmody as he is inducted into the Greensborough Football Club's Hall of Fame as a Member. 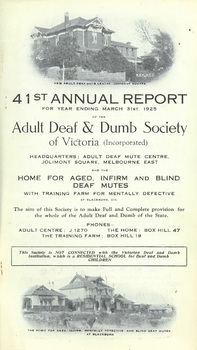 The Annual Reports of the Adult Deaf and Dumb Society are historically significant providing insight into the history of the evolving Deaf Community in Victoria. They are a annual 'snapshot' of the year with references not only to the progress of the Mission but also to the significant people and events within the Deaf Community. 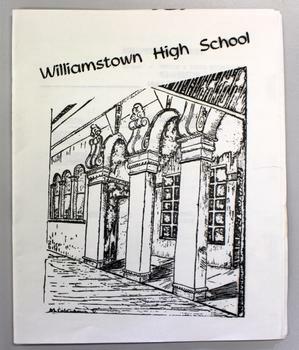 This is Newsletter No 1 Vol .6 produced in February 1966 by Mr T. A. Sheehy CMHS for members and visitors Topic; Chelteham Arts & Crafts, East Bentleigh State School Register The Aims of the CMHS are ‘to record the history of the City, and register something of the Australian Atmosphere, which the necessary speed-up in post-world-war two (WW11) immigration has caused to be lost; to produce a magazine at regular intervals, featuring the work of pioneers and the changing Australian scene; to work constantly with a long range view towards building a hall where records and exhibits can be housed’ (1961) The Original Newsletters reflect the history and heritage of the former City of Moorabbin — derived from Mooroobin, ‘a resting place’ in the Bunurrung spoken language. In 1994, the City of Moorabbin was integrated into the Cities of Bayside, Glen Eira, Kingston and Monash. White folded paper, printed in black booklet of 20 pages. 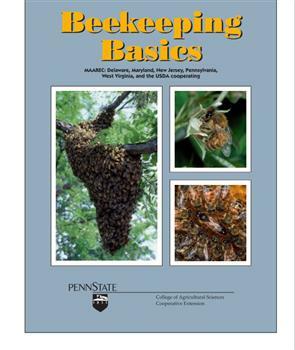 Contains school rules, plan of class rooms, school hours and general information. "The Gesture" was an independent organ of the Deaf and Dumb having no direct connection with any single organisation. 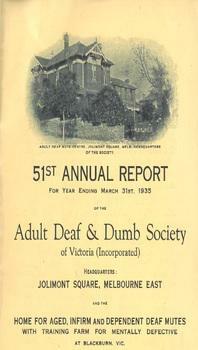 Its aim was to help all agencies established to promote the advancement of the Deaf and Dumb. 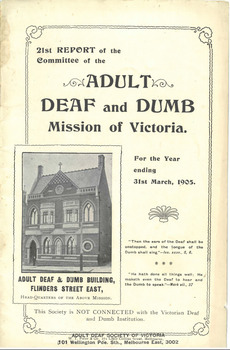 The aim was to be the "Voice" of the Deaf and Dumb of Australasia". To educate the public as to the real condition and needs of the afflicted brothers and sisters, to bring prominently before the hearing and speaking community the peculiar difficulties and obstacles that Deaf Mutes have to encounter in the battle of life. 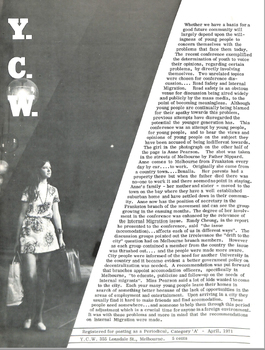 The magazine was named "The Gesture" with the single object of impressing upon the minds of the hearing friends the uncontrovertable fact that whatever the system of instruction the Deaf Mute invariably resorts to the manual alphabet and the language of gesture as the only expedient means of communication with those similarly afflicted. 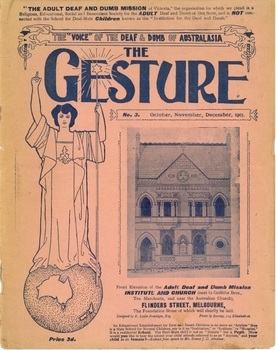 The "Gesture" is significant as the first national newsletter of the Australasian Deaf. Topic Collins Expedition 1803; The Aims of the CMHS are ‘to record the history of the City, and register something of the Australian Atmosphere, which the necessary speed-up in post-world-war two (WW11) immigration has caused to be lost; to produce a magazine at regular intervals, featuring the work of pioneers and the changing Australian scene; to work constantly with a long range view towards building a hall where records and exhibits can be housed’ (1961) The Original Newsletters reflect the history and heritage of the former City of Moorabbin — derived from Mooroobin, ‘a resting place’ in the Bunurrung spoken language. In 1994, the City of Moorabbin was integrated into the Cities of Bayside, Glen Eira, Kingston and Monash. 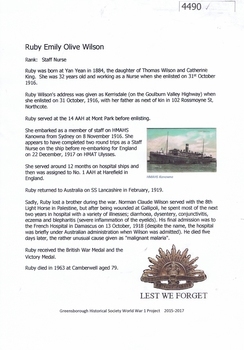 A short article about Nurse Ruby Emily Olive Wilson and her service in World War 1. Ruby was born at Yan Yean. Double sided foolscap typed sheet. 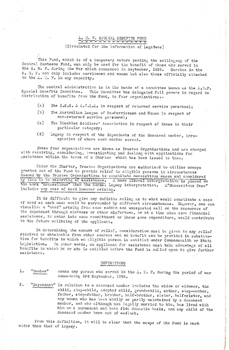 Information for Legatees about the availability and administration of funds from the AMF Benefits Fund after the Second World War. Legacy was one of four organisations who were known as Trustee Organisations for the distribution of funds to dependants in necessitous circumstances. The document notes that both the scope and definitions of the AMF is wider than those of Legacy at that time. 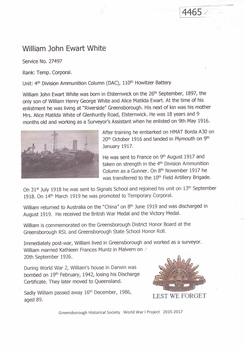 A short article about William John Ewart White and his service in World War 1. William White lived in Greensborough.